Comments: Jack's Pond is a peaceful place with a fun playstructure. 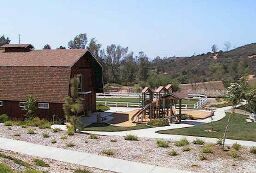 The pond is along a walking trail and is a distance from the playstructure. We did not see any ducks. There is a large "barn" type building with a modern interior that is suitable for birthday parties or playgroups and meetings. Call to inquire about availability. Play Equipment: One large play structure that is fun for all ages! There are challenging slides for older kids and smaller slides for the young ones. There are no swingsets here. Field: There is a large grassy area to play on. Suitable for frisbee and kicking a ball around, but it's not a large field. Pond/Ducks: Pond yes, ducks no.